J, Indi, and I took a 5 day road trip. We first went to Death Valley for a couple of days, and then we went to June Lake. 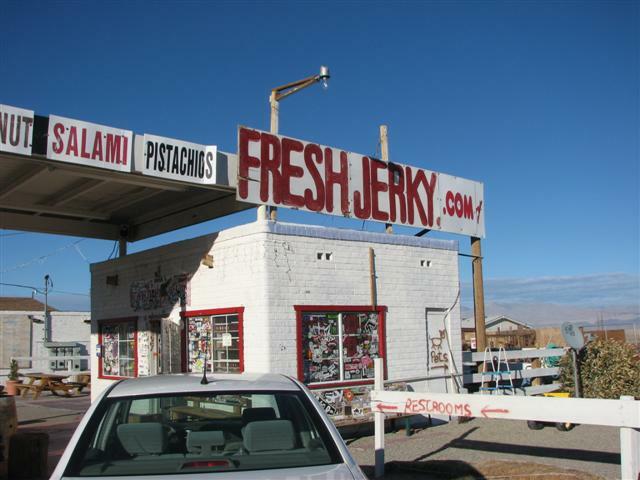 One thing that you will notice while driving on the 395 towards Death Valley is the multiple signs for Fresh Jerky. After seeing all the signs you would expect this really big place, right? Nop! This is a little place and it has the BEST jerky. The little shop is just before (if you are on the 395 north) the turn for Death Valley which is the 190. They sell lots of yummy stuff such as stuffed olives, pistachios and other types of nuts, honey, and as mentioned above the best beef jerky! A stop at Fresh Jerky is a total must! This was my second time visiting Death Valley. The first time I went we camped at Furnace Creek. 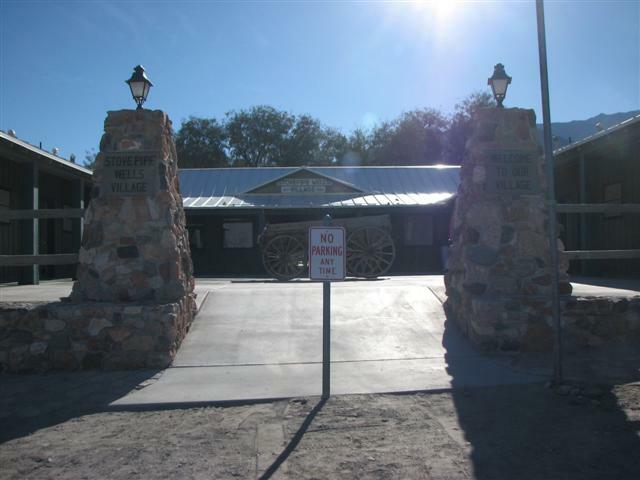 This time around we stayed at Stovepipe Wells Village. EVERYONE at this hotel was soooo nice. 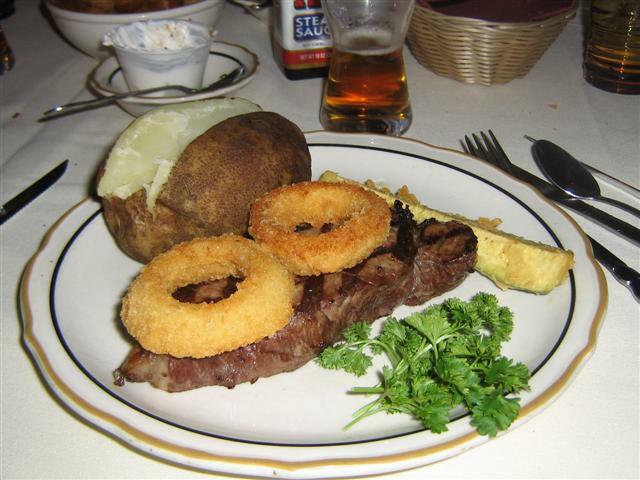 The staff was super friendly and helpful: the people at the front desk , the restaurant, the bar, and cleaning staff. We had breakfast and dinner at the village during our stay. Both were good, I highly recommend the pork ribs for dinner as they were really really good. J and I had a great time hanging out at the bar drinking beer, playing pool, and eating! The bartender was super nice and very attentive and made sure that the beers kept on coming! June Lake is officially my favorite place in the world. It is just so pretty and serene. 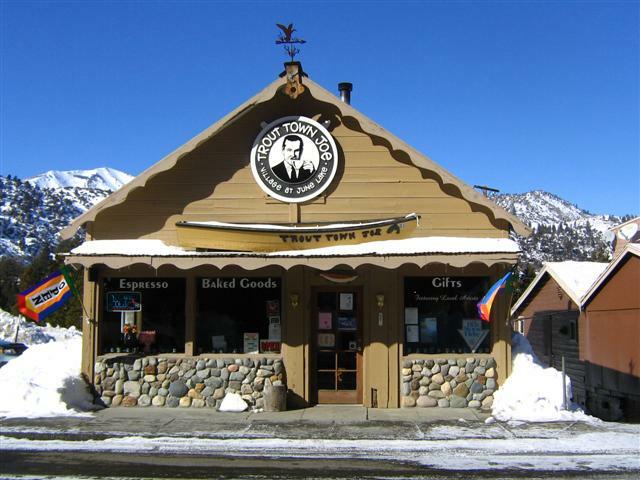 One of my fondest memories of the second time I visited June Lake about 4 or 5 years go was going to the local coffee shop “Trout Town Joe” and have some good coffee and sweets. The owner Gloria is super friendly and so is the rest of the staff. The food is really good. I took my book with me and spent a couple of hours enjoying some me time with my book on our second day. The following day I stopped by for breakfast, and then later with J for lunch. We both had “turkey bacon swiss panini” made by Gloria herself and it was YUMMMYYYY. Make sure you stop by and pay her a visit and grab some food, it is really worth it! While on a walk we met a very nice and friendly gentleman named Russ. While our dogs played together we chatted and her suggested a couple of good local restaurants. If you are in town on a Monday night, then you must go to Eagle’s Landing Restaurant for their “Mexican Mondays.” This is very nice and cozy restaurant and the food is really good. The prices for Mexican Mondays is very reasonable. And once again, the staff here is super friendly and attentive. Everything is made on location. The chips and salsa was sooo soooo good. 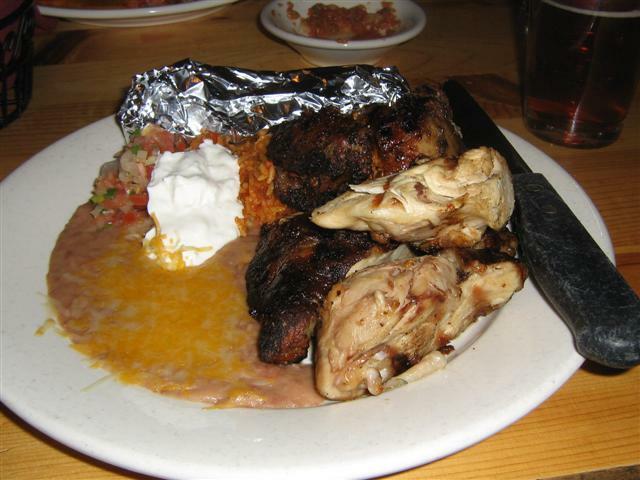 Here is a picture of my dinner which was a “Mexican” Rotisserie Chicken. 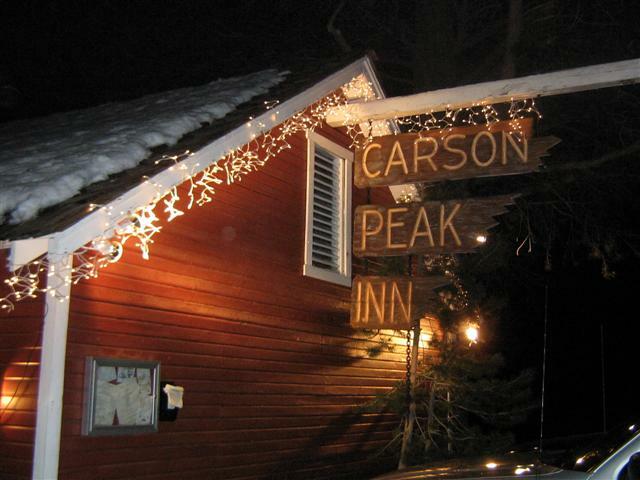 The following evening we visited Carson Peak Inn. This is also a very nice and cozy restaurant. Just like everywhere else in June Lake the staff was super friendly and the food very yummy! The prices are a little high, BUT, you get a lot of food and it is GOOD food. First there is a salad and all the salad dressings are homemade at the restaurant. The raspberry vinaigrette and dijon mustard were awesome! Then comes the garlic bread which is very good. 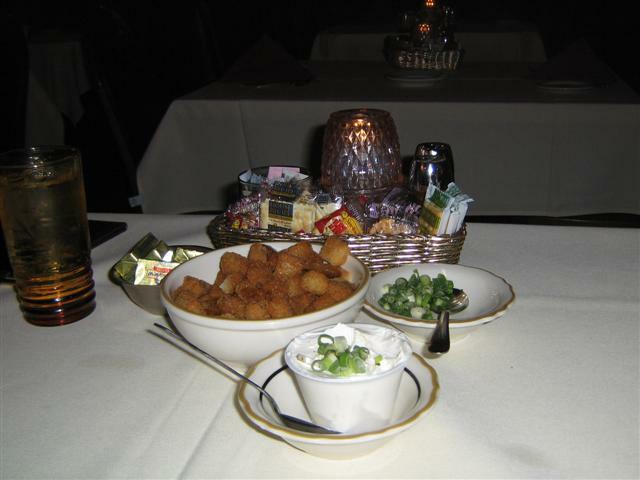 The dinner plate is served with a baked potato and preset on the table you will find homemade croutons, chives, and sour cream for it. 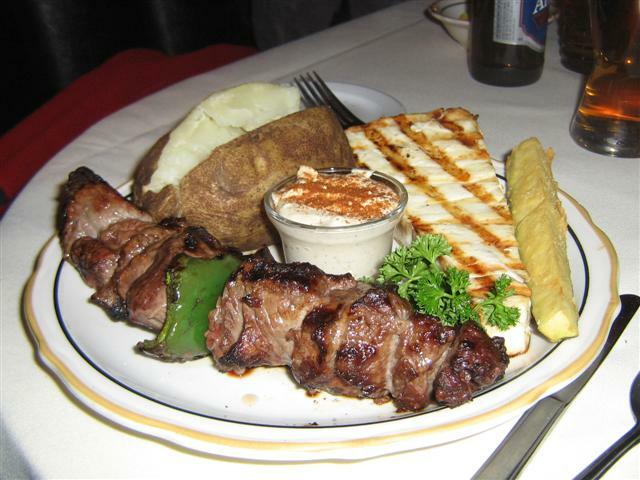 And at last here is dinner: I ordered a steak and J ordered a combo plate with fish and steak kebab, I can’t remember what they called it, but it was excellent!!! OHHH the yummminesness!!! Just in case you were wondering, yes, we took the leftovers home. They were so darn good the next day for breakfast!!! That’s all from this trip! If you guys are in any of the these area, make sure you stop by at these places because they are all really good!